Shipping costs will be added.. This is for candles shipping within the US (not including Alaska or Hawaii) If you are ordering from overseas, please choose the International product. If you are ordering more than one candle, please contact me first as additional shipping fees will be required. After purchasing a Magick Candle Spell, please CONTACT Lexa with names and birthdates of parties involved and a few sentences about candle purpose. 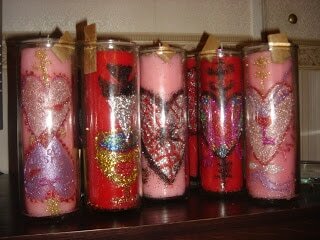 Candles are handmade and blessed and charged and phases of the moon and astrological positions play a part in that. This is not a rush job. Great care is taken with the work. Please allow 4-6 weeks for delivery. Many spiritual practices utilize the burning of candles in association with ritual and prayer. Ancient mythologies believe that the bee is a messenger to the gods and bee's wax or candles are considered conduits of spiritual energies. Prayers and wishes are carved into candles and when burned, these messages are delivered DIRECTLY to the gods and goddesses. Magick candles are hand carved by the Witch with kabbalistic and ancient seals. Each seal has a power and a specific vibration associated with it. The candles are then anointed and blessed with sacred essential oils and herbs. 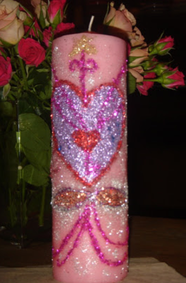 The seals are decorated with fairy dust (glitter) and placed in a fire proof glass. 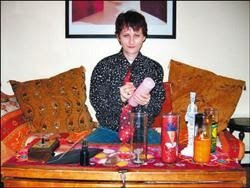 The candle is then charged and given to the client (practitioner) to burn. While burning, the practitioner uses prayer (words of power), and visualization to empower the magick. The candle begins working while it is being carved and gains power as it is lit and its power culminates with the completion of burning. When burned continuously, candles take 5-7 days to burn to completion. They will take longer if turned on and off. NEVER blow out a candle. Snuff out or cover to extinguish and do not move until wax hardens. When you relight, reaffirm your wish. There is a candle for any and every situation. Common themes are love, health, work, money, luck, protection, and most importantly uncrossing or the removal of obstacles. With any problem area of life, it is suggested to begin with an uncrossing candle to "clear the road" before proceeding with a candle to fulfill your wish. Lexa also suggests a consultation first if you are not sure what type of candle magick you need. ordering from within continental US please choose US shipping option. additional shipping fees will be required. astrological positions play a part in that. This option is for pick up only in NYC. Lexa will notify you when your candle is ready and we will set a time for pick up. Remove the paper tab before lighting. Place candle in a safe place and do not leave burning candle unattended. Speak a prayer in your own words to God/dess when lighting candle. Sit in front of candle at least 3x a day and visualize or verbalize your wish. 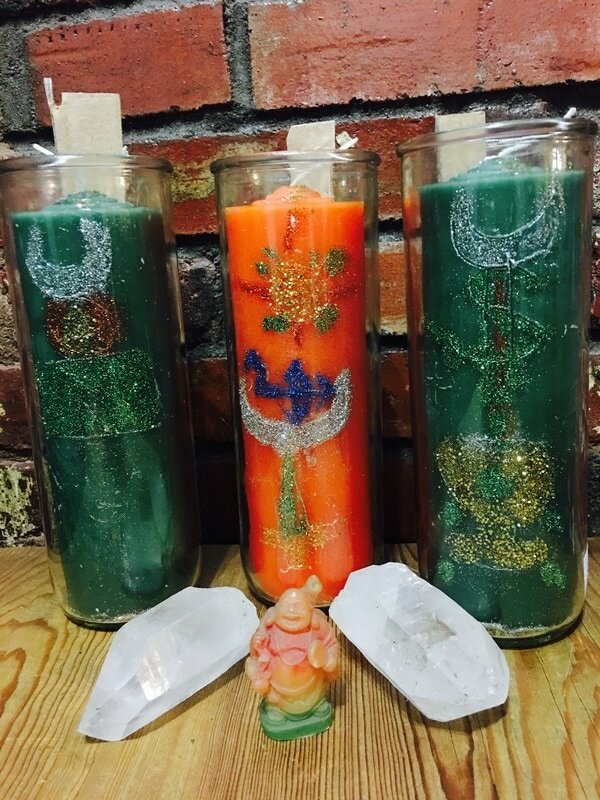 Candles for new situations work best when begun on a new moon. Candles to get rid of negative energy are best when burned during a waning moon. Candles to complete a matter or bring something to fruition should be burned on or around the full moon. GOOD LUCK AND GOOD MAGICK. Candles are non refundable as they are designed for specific persons and cannot be resold to another. All candles sold as curios only. Remember, the real magick is within you. If you don't see what you need ~ just ASK. I ordered a custom candle from you about six months ago. It worked. At first I was a little inpatient. I wanted everything over night. But then i realized good things take time. Then things slowly starting taking its place. It was amazing. Our lives are not perfect and I would never want it to be. But My husband and I are a lot happier now. Thank you so so much for taking your time and effort on our situation. My next step is ordering a fertility candle. Once again THANK YOU THANK YOU SO MUCH.. MUCH LOVE AND RESPECT, Erika Lopez!! Greetings from Oklahoma. Mom & I made it safely out here. I need to tell you about that candle you made to sell my home. I don't remember the exact date I lit the candle, but did so according to your recommendation. I listed my home on October 2, 2006 and had a CASH offer on October 6, 2006, with a closing date of 10/31/06. Even the realtor was amazed & said it had to be the candle. Never seen anything like it! So a huge thank you for that very special and wonderful candle.